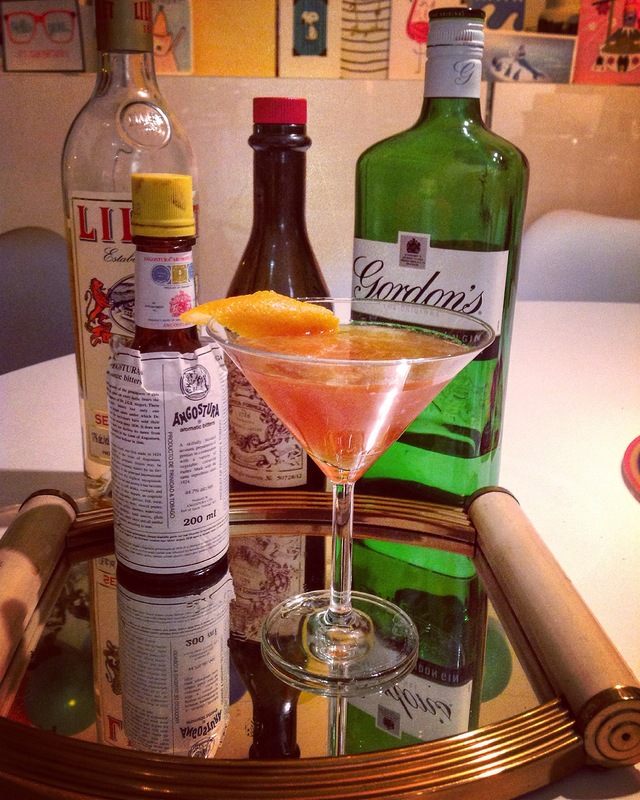 The Belmont is a truly odd little recipe – three ingredients: gin, grenadine & cream. I can’t think of many recipes that combine gin and cream, but the Belmont just goes straight for it, via the grenadine. The result, as described by my friend & fellow cocktail explorer, Craig Riley, is a ‘grown-up Baileys’. He’s right – the gin and cream should clash horribly, but the grenadine just seems to act like a silky buffer between the two, making them harmonious rather than jarring, and letting the drink become a smooth mouthful. 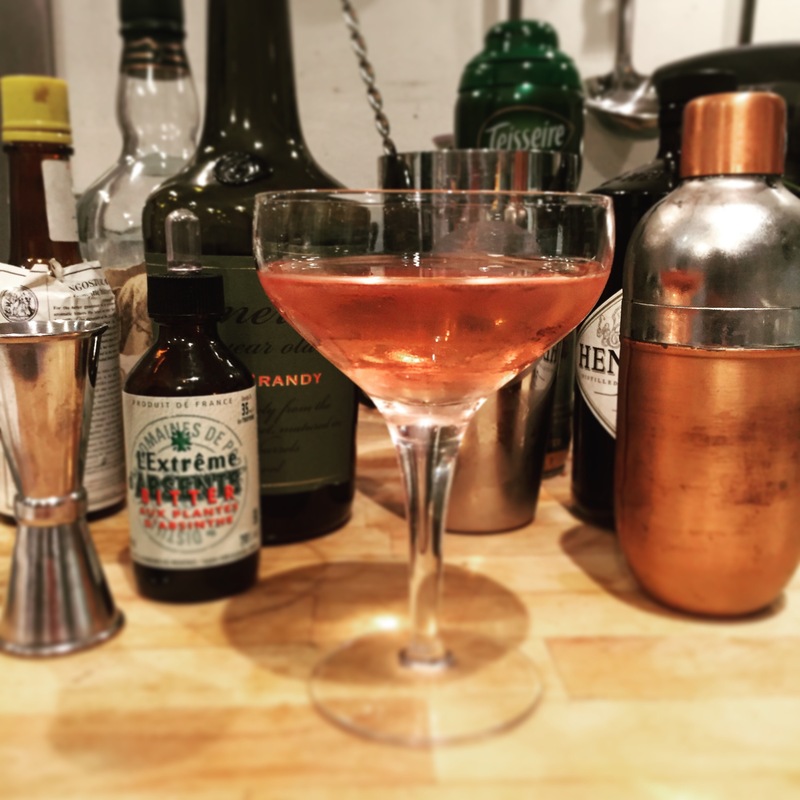 The secret is a good grenadine – I used the Jack Rudy small-batch syrup, which has a good balance of sweet and sharp, along with a deep ruby colour. This gives the resulting drink has an attractive pale pink colour as well, another unusual trait. Not a cocktail you would want many of, but as something, smooth, refreshing & very unusual, worth a glass at least. Shake everything with plenty of ice, then strain into a cold coupe. No garnish or bitters for this one, so it breaks a lot of the cocktail rules. But then it uses cream, so it’s already way off track, anyway. This simple mixture of cognac, almonds and lime sounded like an interesting recipe from Harry MacElhone, but it involved making the orgeat syrup first, as my attempts to find a ready-made product suggested they were all a bit disappointing. That may seem like overkill, but I at least have an ingredient now to use in various Tiki-style recipes, as the recipe produces around 250ml of the sweet, almond-flavoured syrup which will last a month or so in the refrigerator. The story goes that MacElhone invented this drink in honour of a Japanese delegation visiting Paris in the 1920s while he was running his eponymous bar there. The ingredients themselves don’t suggest Japan to me, as my visits to the country have not indicated that there is overwhelming demand for almond or lime flavours; the cognac might have been a nod to the French location of the drink’s birthplace. I am not quite sure what to make of the finished drink: the combination of cognac and almond syrup is silky enough, but the lime juice is slightly too strong to my taste. Thinking on other lime-based drinks (such as the Margarita), I cannot see why it should jar here, but it does – perhaps its is the cognac-and-lime mix that seems a little harsh. Either way, the drink was not as smooth as I was expecting, and despite the sweetness of the orgeat syrup, the lime has a really attack on the back of the throat. The next time I make one of these, I plan to use a properly Japanese substitute : yuzu juice. This has the required citrus tones, but slightly less attack. I think this will balance the drink better. Shake the ingredients well with plenty of ice (probably a good time to practice your Japanese shaking technique), then strain into a chilled cocktail glass. Garnish with lime zest. Another recipe that can be made with Old Tom or dry gin – again, I am using a lighter London style in Hendricks. The mystery of this drink is why the ‘and’ in the title; the answer is in the ingredients: gin *and* brandy *and* vermouth. This sounds like a drink invented by someone ho couldn’t quite work out what to drink, so just kept adding ingredients. But in reality it is pretty well-balanced. The gin and brandy work well together; I can’t imagine a bourbon equivalent marrying so well, it really has to be brandy. Richard Godwin describes it as having a ‘Fred Astaire sort of sweep’. I can see what he means – it seems to waltz around the tongue, rather than march over your mouth. I slipped away from the recipe by using a lime twist, rather than lemon. Why? Because I wanted to see if it worked, and the subtle citrus note seemed to be more elegant, even if the colour didn’t really work. It’s your glass: you choose. Stir well over ice & strain into cold glass. Garnish with a zest twist (see above). This seems very apt, given our PM, David Cameron’s recent entanglements with questions of off-shore funds and inheritance. 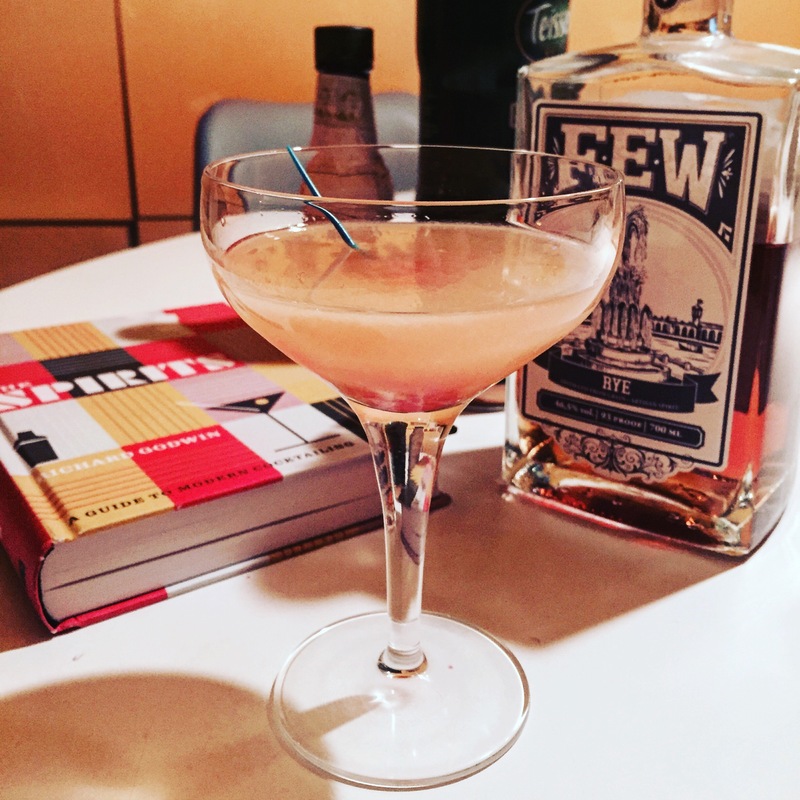 The drink itself is a variation on the Bronx cocktail – a solid mixture of gin, vermouth & fresh orange juice – with the addition of some dashes of Angostura bitters. How it got its name is open to question – some suggest the addition of bitters represents the attitude to taxation. My own take is that, like taxation, this mixture: gin, vermouth, some citrus & bitters is fairly universal. Either way, this is a very drinkable cocktail – it’s very refreshing, like the Ward 8 I tried last week, not heavy and the sort of cocktail you could imagine having more than one of. Shake well over plenty of ice, then strain well into a Martini glass. Twist orange zest over the surface to express the oils onto the drink and serve. The Ward 8 belongs to a fairly small set of cocktail recipes, apparently inspired by political events. The story with this one is that it commemorates the winning of a seat in the Massachusetts legislature by one Martin Lomasney – with the eighth electoral ward being the one to return him the winning margin – at the end of the C19th. I imagine the election was held in warmer months, as the drink is essentially a sophisticated whiskey sour, made with rye and a mixture of orange and lemon juices, so it’s a cool & refreshing drink, with a gentle alcohol burn from the rye. A small amount of grenadine lends an attractive colour, and acts as the sweetening agent. It’s a little too sour unless you have very sweet orange juice, but I wouldn’t be inclined to add too much grenadine to compensate; it’s slightly too cloying a sweetness & the whole drink could end up tasting like orange boiled sweets without care. Shake well over plenty of ice & double strain (for the orange & lemon pulp) into a martini glass. Garnish with a single maraschino cherry. So, here’s an oddity. Traditionally, the French 75 is a champagne cocktail, made with some simple syrup, gin & champagne, most likely invented by Harry McElhone at his American Bar in Paris in the 1920s. It’s a good drink in itself and very popular. But today, Mixellany tweeted a recipe culled from the pages of Harry’s own book, the ABC of Mixing Cocktails, for his original ’75 cocktail’, and bizarrely enough, there’s no sign of champagne in this recipe at all. Instead, we have an entirely calvados and gin-based drink, enlivened with a dash of absinthe and some grenadine syrup. But even then, Harry describes the name as being taken from a light field gun, used by the French army in the First World War, traditionally the inspiration for this drink. The champagne-based recipe then turns up in the Savoy cocktail book, published around five years later. So which one is the correct 75? The answer is probably both, a little like the Derby cocktail I have described in the past; the cocktail was named after a popular horse race, and many bartenders have developed their own drink inspired by the race. The champagne and calvados variants probably developed separately, but at around the same time. The mystery is how the champagne version got attributed to McElhone, when his own book describes the other. Either way, this is a good drink – calvados is an unusual ingredient, being richer and fruitier than cognac or armagnac; the presence of the absinthe adds an unusual aniseed note, and the grenadine gives it a sweetness and elegant pink colour. The flavour is something I’d describe as ‘old-fashioned’, having a combination of fruit and spice, but it’s an intriguing drink overall. Shake well over ice, then strain into a chilled martini glass. McElhone makes no mention of garnish or bitters, and with the combination of ingredients given, neither are needed. A visit to the lovely 69 Colebrooke Row recently meant that I came home with a copy of Tony Conigliaro’s book of the same name (which is odd, as officially, the bar itself has no name, only an address). The photography in the book is gorgeous, featuring not only the drinks that have made the bar’s name (see above), but some of the staff and clientele. If reading it doesn’t make you want to visit, nothing will. One of the drinks features is the Blood & Sand, a drink which follows in the (fairly) long line of whisky-based cocktails invented for show premieres (see the Rob Roy, earlier). In this case, the drink was invented for the premiere of Rudolph Valentino’s 1922 bullfighting story, Blood & Sand. The colour palette of the ingredients suggest why they might have been chosen, but the barman had clearly thought the mixture through, & although none of them are Spanish to suit the film’s setting, the drink is a refreshing mixture of tart and sweet. I’d heard of variations using grapefruit juice to point up the tartness, so I switched the plain orange juice in my version to blood orange, which seems very apt for the recipe. This is a very drinkable cocktail, and one that would be good to give to someone who has previously said they don’t like whisky; it might just convert them. Shake well over ice, then strain into a chilled coupette. Note, the 69 Colebrooke Row recipe eschews bitters or any garnish. I have followed suit here, thinking the presence of orange zest might be a little too powerful here. Another cocktail that uses Scotch as a base, and allegedly, Marlon Brando’s favourite: the Godfather. A combination of Scotch and Amaretto, it’s a little too sweet for me, and has an oddly old-fashioned sort of a vibe (as opposed to an Old Fashioned); I really can’t imagine Marlon knocking these back after dinner. Happy #saturdaynightcocktails and Happy Easter, all. Waiter, my drink is on fire. Aiuto! How did this happen? Gorgeous Lily Bellini has turned 18 today. Spritz e Bellini per tutte!